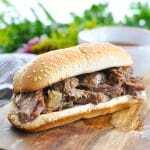 These french dip sandwiches are the perfect satisfying comfort food meal to feed the family on busy weeknights. Nothing says “comfort food” like the aroma of a warm roast wafting through your home. 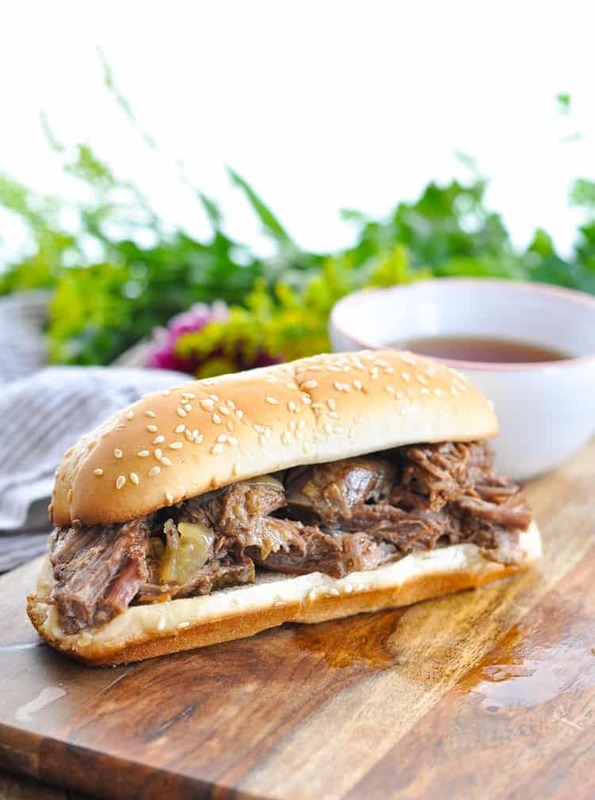 These Slow Cooker French Dip Sandwiches are the perfect satisfying and easy dinner option for busy home cooks that need family-friendly meals! The contrast of the crusty French bread and the tender, juicy meat brings this sandwich to the next level. 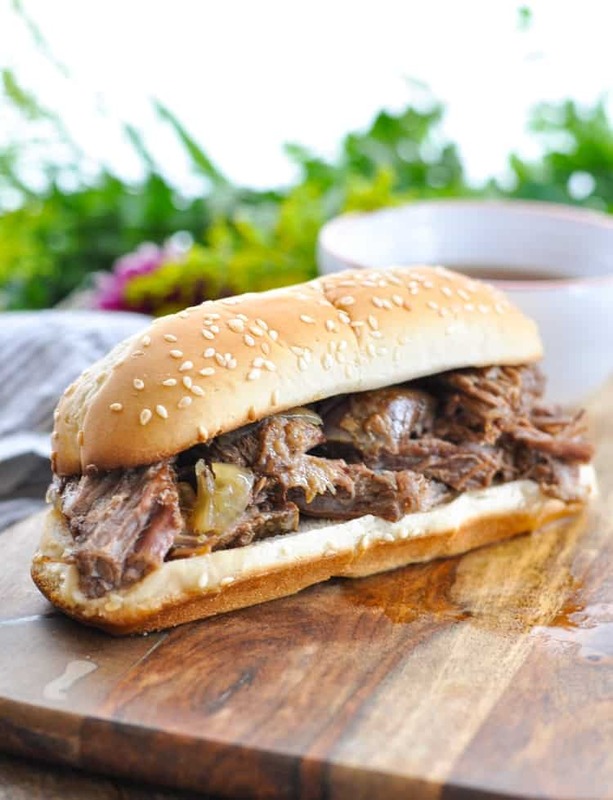 By making it in the slow cooker, you can prep the dish in the morning, run your errands, and have a home-cooked lunch (or dinner) waiting for you at home. Hey, friends! 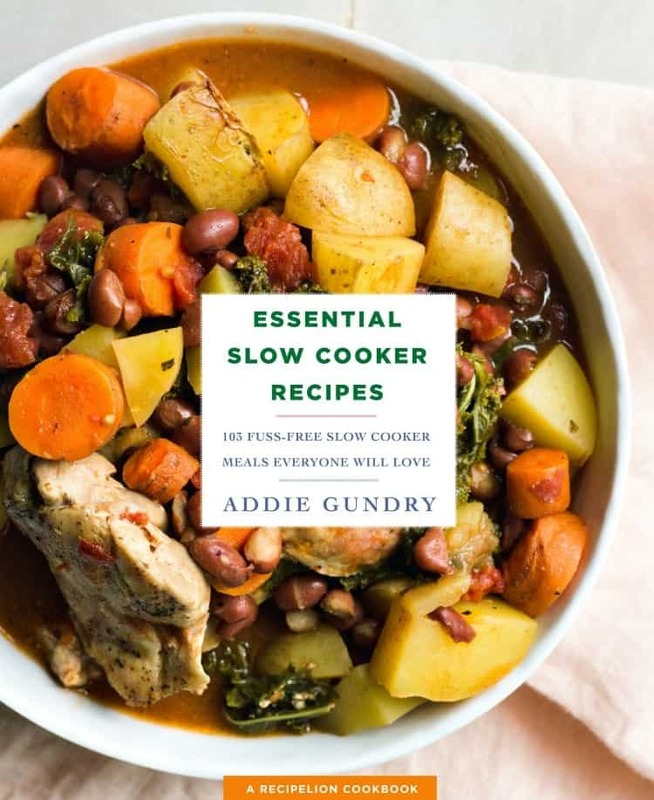 I was recently gifted another new book from celebrity chef Addie Gundry called Essential Slow Cooker Recipes: 103 Fuss-Free Slow Cooker Meals Everyone Will Love. After reading through the recipes, I immediately asked the publisher for permission to share one with you here. The meals just looked too good to keep them to myself! I used my family as guinea pigs (as I often do), and we taste-tested a number of the delicious ideas. 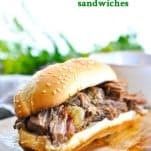 In the end, I selected the Slow Cooker French Dip Sandwiches to share on the blog because they won the full stamp of approval from my entire family — which is no small feat! The tender, rich, flavorful beef is so incredibly good that every single one of my boys devoured his supper (and Keith continued to talk about the sandwiches long after the meal was over). 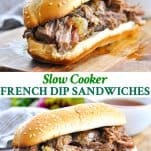 Plus, with help from the slow cooker, these French Dip Sandwiches are about as easy as it gets! Just leave them cooking on your countertop while you go about your day, and you’ll come home to a warm, cozy dinner when you’re tired and hungry. Heaven, right?! Thanks so much to Addie and her crew for allowing me to share this delicious recipe with all of you! Spray the insert of a 7-quart slow cooker with cooking spray. 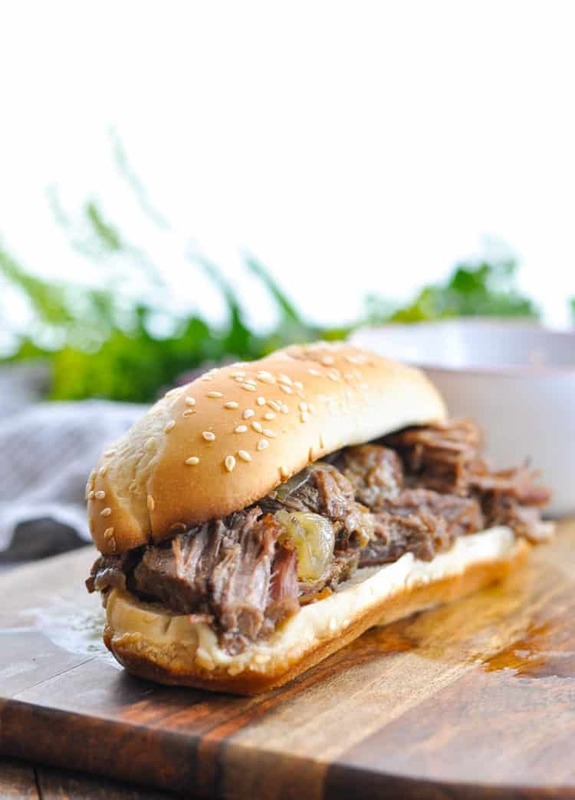 Rub all surfaces of the chuck roast with 1 tablespoon of the olive oil, the salt, and the pepper. In a large nonstick skillet, heat the remaining 1 tablespoon olive oil over medium-high heat. Add the roast and sear all sides until browned. While the meat is browning, place the sliced onion in the slow cooker in one layer. Transfer the roast to the slow cooker and pour the broth and Worcestershire sauce over. Add the bay leaf, cover, and cook on Low for 6 to 8 hours. Transfer the meat to a cutting board to cool for 10 minutes. Skim any excess fat from the juices in the slow cooker. Slice the meat into very thin slices and return it to the juices in the slow cooker on the Warm setting until serving time. Preheat the broiler. Open hoagie rolls and toast on a baking sheet under the broiler, just until golden brown. Place slices of the roast on the bottom halves of the rolls and use a slotted spoon to add some onion slices. Serve with the sauce on the side for dipping. Mmm this looks SO good, Blair! I just made philly cheesesteak sandwiches and bow these french dip ones are calling my name! Such pretty pictures and I love how easy this is! Definitely a winner for my husband and I! 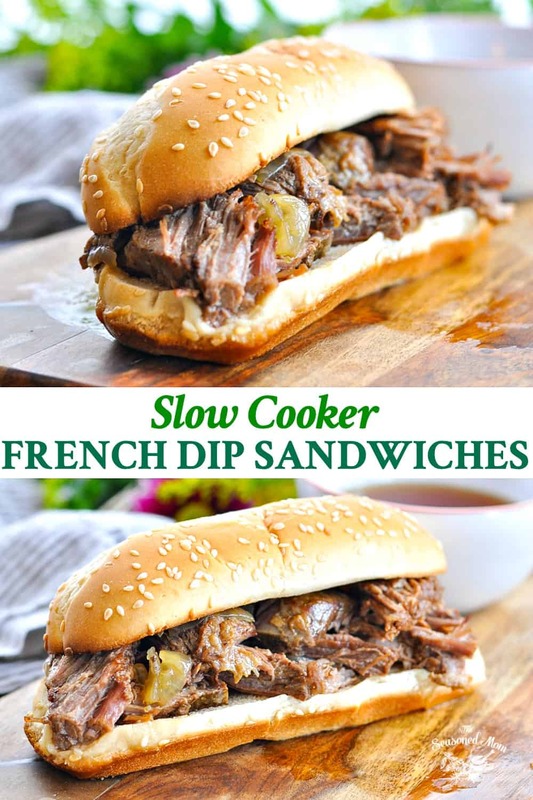 I’ve never had a French dip sandwich before but these look incredible! I’m going to have to try it with gluten free rolls!